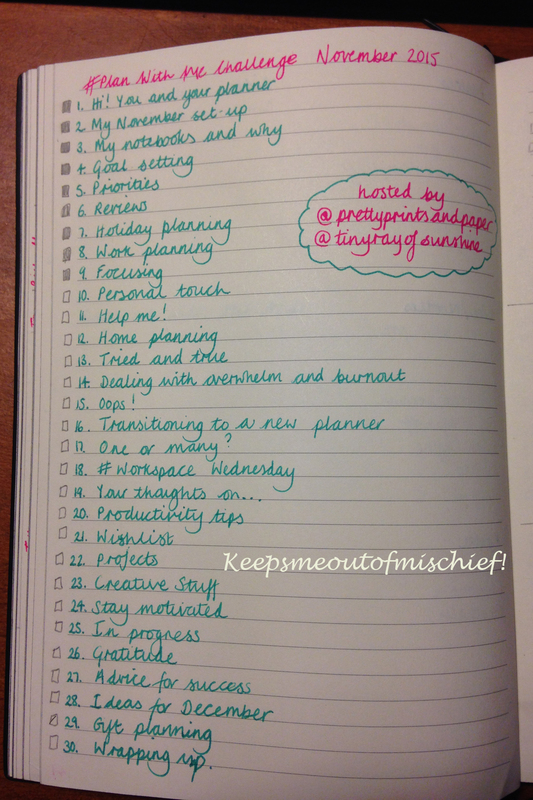 Planner version 2 – Adventures in Bullet Journaling | Keeps Me Out Of Mischief! 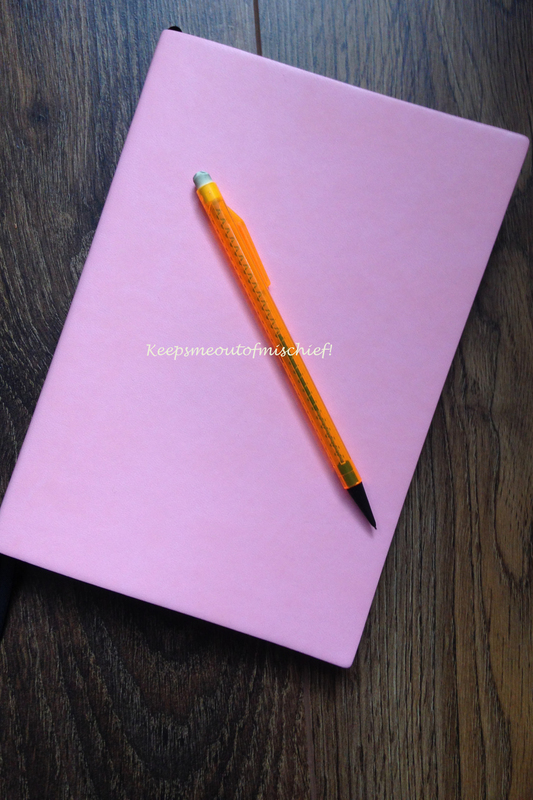 Last week I wrote about the beginnings of my quest to find a more organised way of life and how my initial Filofax based planner had evolved into a bullet journal. This is the rather beautiful notebook that I decided to use to see if the bullet journaling method would suit me and keep me organised. My dad has a similar stationery obsession to me and he bought me this one just because it was my favourite colour! It’s got a beautiful soft pink cover and fairly thick paper. My only quibble is that I’m experiencing a bit of pen bleed through, but as I prefer to write in pencil, this isn’t a huge issue. I’ve only been using it for one full week so far, but I have to say it’s definitely made me approach planning in a whole new way. I’m not necessarily following the bullet journal method to the letter as shown here, but I’m adapting it as I go along to suit my needs. At the front I have used the first couple of pages to index everything that I’ve added to my bullet journal. So far I haven’t really needed to refer to this as I haven’t really got that much in it, but I can see it coming in useful as I get further through the experiment. The legend is the codes that you use for all of your entries. I’m using a slightly different version than the original method, but again, I’ve adapted it for my needs. It’s quite an intuitive set of symbols and I’ve not needed to refer to this legend at the front since the first day I started to use it. 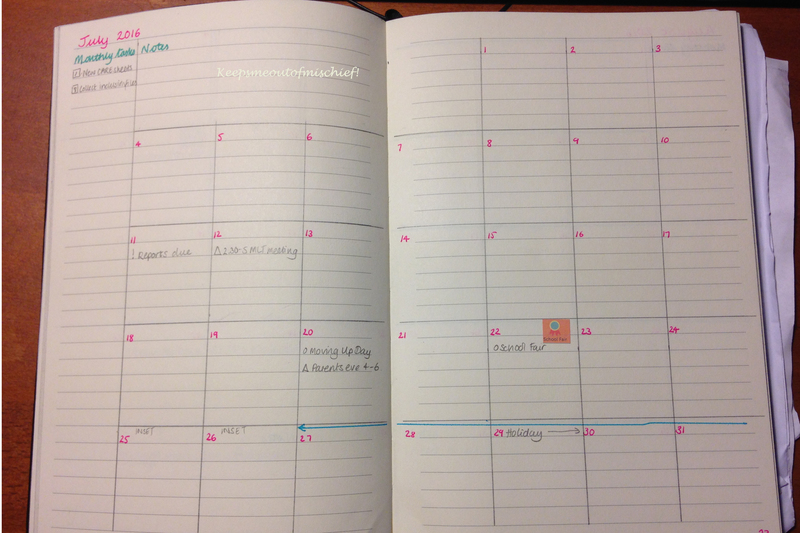 The orignal system lays out a monthly calendar as you reach the month during the use of your journal. In my professional life, I can’t work like that. Hey, in my real life I can’t work like that. I work on the academic year, I’m institutionalised! I’ve set out all of the months through to July next year at the front of the journal so that I can write in events and meetings as I arrange them, rather than trying to keep this information elsewhere. 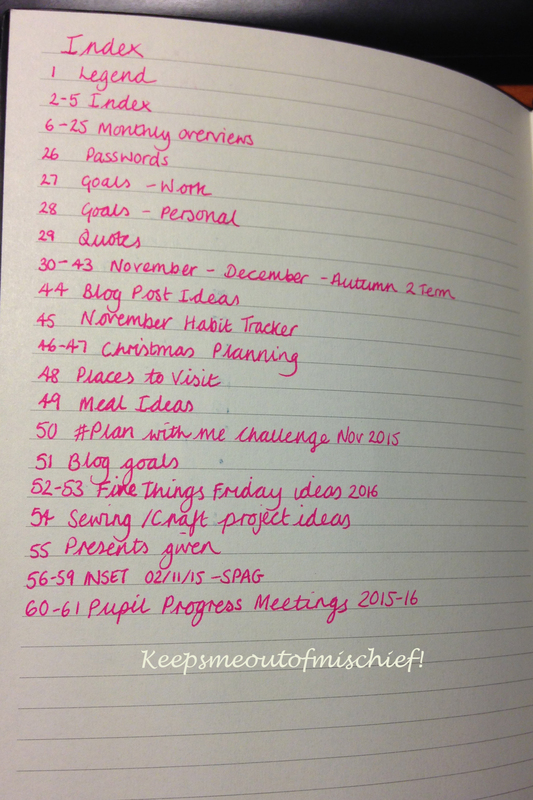 The system is wonderfully adaptable, so you can create a bullet journal that suits you. This the layout I tried for the first week, I’m trialing a few layouts as I go along to see which one suits me best. 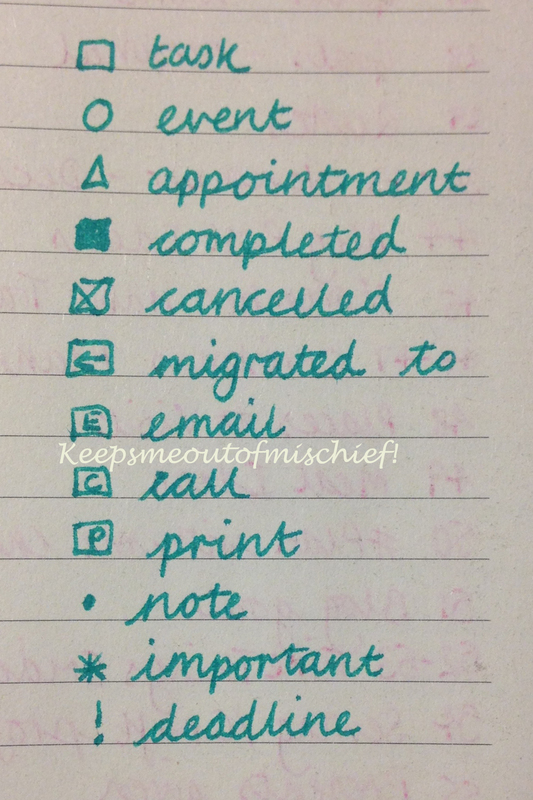 This one worked well, but I didn’t really have enough space to note down all my tasks each day. I’m trying a different layout this week to see if it gives me a better use of the space available. I like being able to have an overview of the week and I don’t think I’d fill a whole page everyday, other than when I’m in the classroom at the beginning of the week. I really like being able to see what tasks I have to do and when, and I like seeing all the boxes coloured in at the end of the week – makes me feel like I’ve achieved something! I decided to participate in the #planwithmechallenge for Nov2015 hosted by @prettyprintsandpaper and @tinyrayofsunshine on Instagram. This wasn’t a social media platform that I was familiar with, so it’s been an adventure. I initially thought that it would be a great way to see how others use their bullet journals and perhaps gain some ideas for mine. As it’s progressed, I’ve realised that it’s making me review how I use mine far more than I thought it would. I’ve already identified collections that I think need to be kept in a separate book so that I don’t have to write them all our again when I change to a new journal when this one runs out of space. So far, so interesting for me. I’ve found that writing everything down means I don’t forget to do anything (for that read ‘ignore the stuff I don’t want to do’). I like the feeling of accomplishment at the end of the week when everything is ticked off or migrated to the following week and it’s much easier to carry around than my previous planner so I’m more likely to take it with me wherever I go. I plan to review at the end of the month to see where I’ve got to and will probably use this method through to the end of the term in December to see how well it works for me.